Welcome to Foodtown Castle! Okay, not quite, but this sure doesn't look like a Foodtown from the outside. We're here in the affluent, suburban Bergen County town of North Haledon, NJ, a few towns north of Paterson. This is a Nicholas Markets store. Their other locations include Cedar Grove, NJ; Washington, NJ (a former A&P which when I visited was pretty desolate); and Colonia, NJ (a former Food Circus-owned Foodtown). Nicholas Markets started when M. Nicholas Maniaci opened his first grocery store in the city of Paterson in 1943; as the Italian population moved out of Paterson and into the suburbs, Nicholas Markets closed their stores in Paterson and Haledon (although they still own the liquor store next door); North Haledon and Cedar Grove are longer-standing stores while Colonia opened under Nicholas ownership around 2013 and Washington in 2015. North Haledon is the flagship store for Nicholas, and it's beautiful. It's very upscale but the prices are not crazy, although many are very high. There are excellent fresh produce, organic selections, bakery, deli, and prepared foods, although I wouldn't buy housewares or HABA here because they're too expensive. Let's head inside! You're greeted by a large produce department with refrigerated cases on both sides. The seafood and meat departments are along the back wall, with deli/bakery/prepared foods in the last aisle. Looking towards the entrance from the produce department. Here's an example of pricing: Kings in Livingston charges $4.99 for a broccoli bunch of about the same size as they are charging $2.99 for, but a smart shopper will go to Food Bazaar in Elizabeth or ShopRite in East Orange for the $1.49 each deal! An unlucky shot of a few almost empty cases, but this wasn't the norm. At the back of the produce aisle we have pickles and condiments and . . . greeting cards? Very nice fresh seafood counter. The meat counter is just past the seafood counter along the back wall. The meat department then continues along the back wall. While I love the flooring, shelving, and ceiling here, these aisles are WAY too narrow. It was obviously designed for much less volume than it actually gets. The different floor textures are really cool! 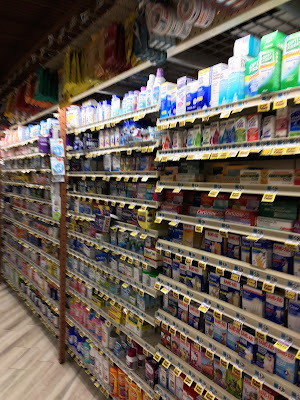 It doesn't help that they clutter up some of the aisles with these displays. The freezer aisles are down at the far end of the store. Dairy is in the back corner of the store. There's also a very large cheese selection in this corner, including a glass-walled room where they make fresh mozzarella. Given that there was a guy making the fresh mozzarella in the room, this was the best I could do! Here we're looking towards the back of the store. There are large service counters to the left with prepared foods and deli products, and there are self-serve cases to the right. The bakery is in the front corner right behind me here. What's kind of funny here is the decorations on top of the bakery case are exactly what is shown in the pictures on the wall! That's kind of a strange choice, but I do really love the decor here. DY Design of Kings Point, NY did this store. A local florist, Anna Rose, that Nicholas also owns, has a small floral section in this store. Looking towards the bakery department from the front-end. Looking back towards produce from the front-end. Customer service is straight ahead. Heading out . . .
Anna Rose Floral and Grand Opening Liquors (I don't get the name) are both Nicholas-owned. The liquor store is next door to the Foodtown, but the florist is inside. Well, Nicholas Markets Foodtown North Haledon is a beautiful store, and the prices are on the high side, but the cramped aisles makes it kind of unpleasant for large shopping. It's actually much smaller than it appears in these photos, I'd guess no more than 30,000 square feet. Definitely a great store, but with a few kinks that need to be worked out.